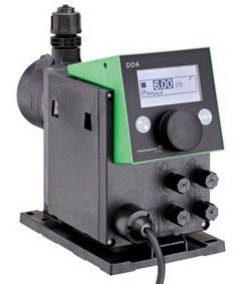 SMART Digital dosing pumps are the next generation of variable speed micro-processor controlled metering pumps. 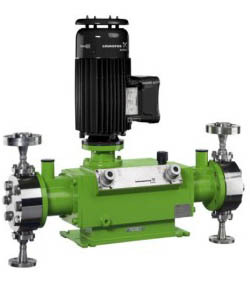 The DDA model is the pump for complex and demanding applications where the focus is on maximum process reliability. In addition to an extended capacity range and a turn-down ratio of up to 1:3000, it boasts patented sensor technology to measure and verify flow, in addition to pressure monitoring. 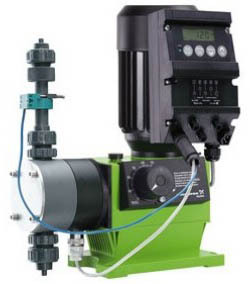 The AutoFlowAdapt feature on the FCM version can will correct the actual feed rate to match the pump’s set point. The package for industrial applications is rounded off by additional operating modes such as a week dosing timer and new functions such as auto deaeration. Scalable control input signals (up to 1:3000 turndown ration) to meet the widest flow rates in one model. DDA FCM : FC + measurement to verify and measure flow. Pump will auto-adapt so actual feed rate matches target feed rate. Turndown: 1:10 with stroke length adjustments, not including frequency control.